What is better for a large group of employee than a tub of colorful, assorted lanyards? 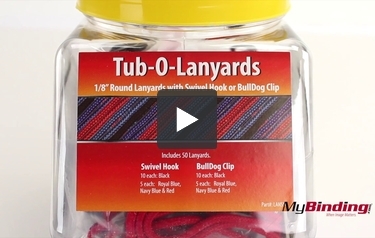 These 1/8" (3mm) Round Braid lanyards are 36 inches in length and are some of the most economical lanyards that we carry, and the Tub-O-Lanyards offers them in a fun and convenient container. This bargain bucket of fifty lanyards holds (10) Black, (5) Royal, (5) Navy blue, and (5) Red of each with bulldog and swivel hook nickel-plated steel attachments. Give your people a choice when deciding how to wear and display their badges with the fun and smart to use Tub-O-Lanyards.